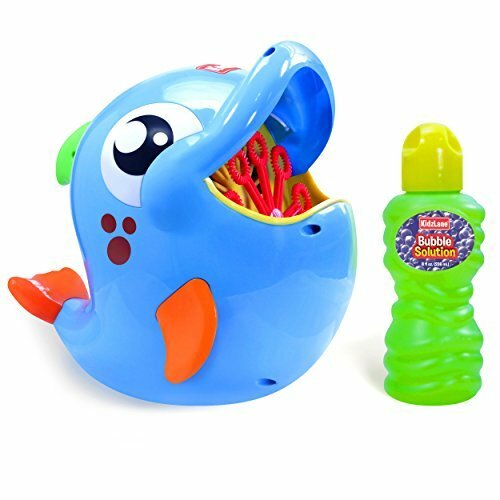 KID-FRIENDLY DESIGN ✿ Fun, bright Dolphin shape will delight kids of all ages as they watch loads of exciting bubbles pour out of its mouth in a continuous stream! Simple and easy for kids to operate and refill. 8 OZ BUBBLE SOLUTION INCLUDED. AMAZING OUTPUT ✿ Get ready for a bigger, better bubble bonanza! A QUIET YET POWERFUL MOTOR and 10 spinning wands pour out more than 500 bubbles/ minute, thrilling kids and pets alike. STRONG & DURABLE ✿ Made using strong, high quality materials, the Kidzlane bubble blower will prove to be durable and long-lasting - so you can buy it once and enjoy for years. STABLE, BALANCED STRUCTURE ✿ This adorable dolphin was designed with a flat, supportive base that will sit securely on most surfaces, thus avoiding unnecessary spills and tip-overs. VERSATILE & DELIGHTFUL ✿ Buy this once and you'll never fear the phrase "I'm bored!" again. Sure to be the hit of any party! Can be used indoors or outdoors. Celebrate birthday parties, playdates, weddings, baby showers, and many more events.